This week's new release for swag is an off-sim waterfall mountain, with running water, an old tree and particle mist at the end of the stream. 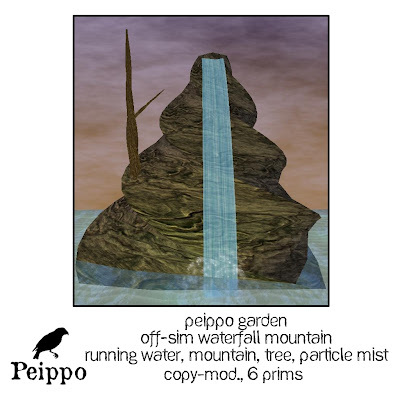 It is just six prims, made of prims, and if you remove the sim connector and keep it on land, you can take it down to five prims. Instructions included in the package. Get it at Peippo Mainstore for 50L$ this weekend!